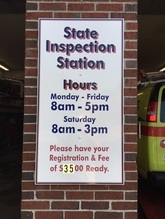 Need an inspection sticker in Winchester, MA? Look no further then Eli's Service Station. ​A Mass Inspection Station conveniently located at 125 Broadway in Arlington. Just blocks away from Route 3, Route 2, Tufts University, Mass Ave and Arlington Center. As a registered Massachusetts Inspection Station we provide inspections on vehicles up to 10,000 lbs. We are also a Mass registered Emission Repair Shop.